Are you looking for a soundtrack with your workout in mind to help you tone up just before hitting the festival circuit? Well, Tiesto is here to help. Just a short few weeks ago, Spotify announced that in addition to future video and podcast partnerships, the streaming service would be extending its app with a fitness extension called Spotify Running. Using sensors to match the listener’s running pace to the tempo of the music, the extension will be able to adapt both user-curated and Spotify-curated playlists through the app. To help with Spotify’s Running commencement, Tiesto composed a special nine track album, BURN, with the runner in mind. Divided into nine “chapters,” the BURN album takes listeners through a montage of fast, slow, and medium for a high-octane, 41-minute workout. 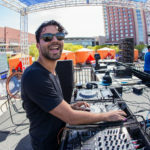 The Musical Freedom head crafted the album to contain only instrumentals, and the album’s tracks range across a multitude of diversified genres, from progressive house to trance to drum and bass to trap. BURN by Tiesto is now available for streaming on Spotify below, and be sure to check back for more info on Spotify’s video and podcast extensions coming soon.